JAN 8-29 BERGEN ACADEMIES-"ALL THE WORLD'S A STAGE"
OCT 14- NOV 4 Group Exhibit of members of North Jersey Art Center- New Milford,NJ. SEPT 9- SEPT 30 IS THERE A DR. IN THE HOUSE? Northern Valley/Demarest H.S. student art exhibit. 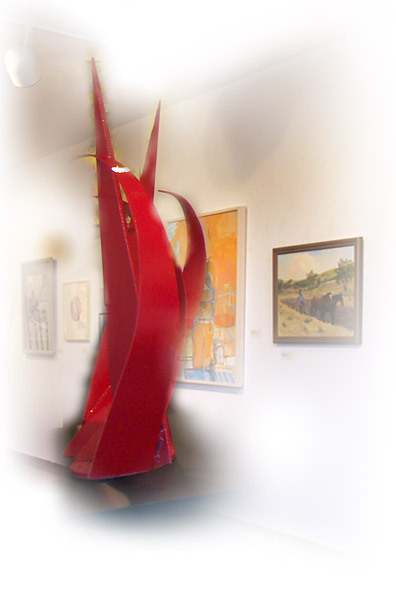 Painting and Sculpture by Harold Nash and Miguel Castillo. exhibition and sale of paintings by the students of the Art Student League, N.Y. and Vytlacil School of Plein Aire, Sparkill, N.Y.
Retrospective Exhibition of Paintings by Gerald C.
Landscape oil paintings by the New York artist Sondra Nones and landscape watercolors by the New Jersey artist Bryan Collins. Exhibition of an Italian printmaker specializing in antique techniques practiced by Venetian masters. Exhibition and sale of paintings and sculpture from students of Art Students League, New York and Vytlacil School of Plein Air, Sparkill, N.Y.
Exhibition and sale of paintings and sculptures by the students of Art Students League of New York and Vytlacil School of Plain Aire, Sparkill, N.Y.
Exhibition of mixed media paintings. Photographs of Northern Valley area and Cape Cod by Mary Ann Farrell. Photographs of Venice, Italy during Mardi Gras by Alice Jacob. Paintings, drawings and photographs by faculty and students of Art Students League, New York and Vytlacil School, Sparkill, N.Y.